The great meeting point between east and west. Austria's capital on the Danube evokes visions of splendid architecture, grand castles, the opera house and more! To see it you need to use Vienna's public transport system- it’s layers deep -the plane feeds into the train (the CAT in this case) that feeds the S-Bahn that feeds the metro that feeds the tram that.....don't worry, all will be revealed. It's not that difficult to master and anyway it's great fun! Vienna is a major city on the Grand Tour along with Budapest and Prague, so many arrivals will be by rail. We follow the exotic assembly of EuroCity trains in from East and West, get you used to the two main stations- the Südbahnhof and the Westbahnhof. The Vorortelinie, an old military inspired railway, is now part of the S Bahn net, we follow it as it snakes across the city and admire the transport architecture of visionary Otto Wagner. 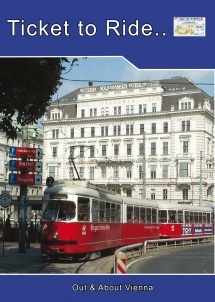 We use our Vienna card to visit the sights, including the twin icons; the cathedral and the giant ferris wheel immortalised by Harry Lime, using the wonderful Viennese tram system and new metro. Then we make a few trips out of the city - by train or tram of course: The Liliput Bahn, Grinzing for the wine of Wien, Prater Park gardens and fun fair, Schönbrunn - the magnificent palace and the Schneebergbahn for a steam train ride up a mountain. We show you hotels, where to drink coffee and eat dark chocolate cake, buy tickets and ice cream! By the time you've watched the film you will think that you've been there and your actual visit, when you make it - will be a breeze!